This report analyzes the effects that technological changes associated with the digital revolution may have in Spain, with special attention to those that affect the world of work. 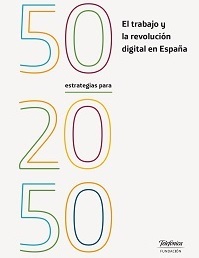 The publication proposes 50 strategies with an eye on the year 2050, so that Spain can overcome the difficulties and take advantage of the opportunities linked to the profound transformations that will occur. Among the conclusions highlights that it will be necessary to address profound changes in the educational, economic, cultural and political systems, and in the very concept of work, to ensure that by 2050 the vast majority of workers have a job.